Ideal for high-impact exercise such as lifting weights and sprinting, glucosamine and chondroitin are naturally occurring in the body abd form the building blocks of cartilage. Cartilage absorbs physical impact and cushions our joints when we move. Our easy-to-take tablets are packed with 500mg of high-quality glucosamine HCL, and 400mg of chondroitin — key components of cartilage and joint tissue. They’re a great addition to your fitness regime as you push for progress. 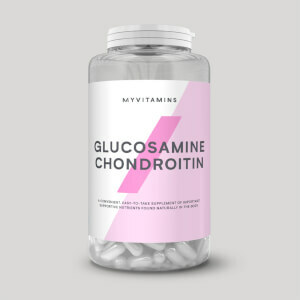 When to take Glucosamine HCL & Chondroitin? What does Glucosamine HCL & Chondroitin work well with? To complement the benefits of glucosamine and chondroitin, add Omega-3 Plus — our super-convenient, high-powered softgels are a great way to get essential fish oils into your diet. 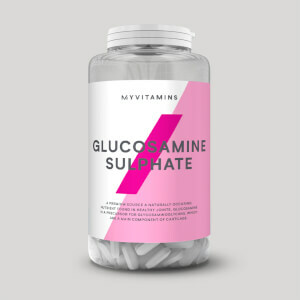 Glucosamine HCl (Crustaceans), Chondroitin Sulphate*, Bulking Agent (Microcrystalline Cellulose), Anti Caking Agents (Magnesium Stearate, Silicon Dioxide). Take theses every day and joint issues like stiff knees or elbows etc and noticeably improved. It takes about 1 month for these to start working but they do work. No weird clicking noises when I kneel anymore and stiff elbows completely normal again. good value and service from MP. Being a keen runner, I was struggling immensely with knee joints and pains. 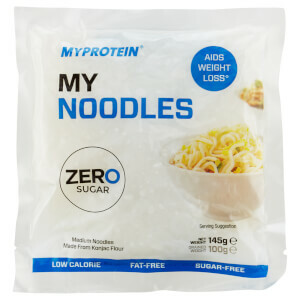 Have included it in my daily intake of Myprotein products, this product has kept me running and keeping the pain at bay. I've even got my elderly mother to start taking it for joint pain as it really does work wonder. Love the stuff. Trust it in terms of what it say on the tin and you won't go wrong! Not sure how best to bring this to the notice of MP so doing this here as a low rated comment. This pill is incredibly hard to swallow. I also take Alpha Men and Omega 3 pills from MP and have never had an issue. However, this pill always hurts while swallowing. Almost cuts through the throat due to its sharp edges and relatively large size. Noiticed benifits day by day, been a week and impact aches have subjued now going to let my mum try em, hope you guys feel the same benifit, good luck with your training. This is a must to help prevent/delay wear and tear on joints caused by physical activity. Taken consistently on a daily basis and you will notice the difference. Take one pill every day and your joints will be kept like well oiled gears. I take these as I lift every day and do cardio too, so these are a means to help reduce deterioration of my joints. Seem to do the job. No pains since taking. Pill is a little on the large side but that's about it. I had shoulder pain in both shoulders for some time. Pain has diminished dramatically since taking these. It is still there but hoping that it goes with continued use. Will continue to buy. Purchased these tablets for Osteo arthritic joints. have only been taking them for about 10 days but already I can notice a marked improvement, would definitely recommend them.